I love Post-its. I use them everyday, to leave myself reminders, as bookmarks, and sometimes to make little stick-man animations; just a small part of my productive and fulfilling private life! And this youtube video showing creative uses of Post-its, is pretty cool. But Post-its are not merely a tool of convenience and fun; they are also a powerful method of persuasion. Randy Garner, at Sam Houston State University, wanted to find better ways of increasing survey response rates. I sympathise; one of the hardest things in my psychology degree was getting people to take part in my dissertation project. I tried everything; face-to-face solicitation, internet marketing, interpretive dance; I even advertised on Craigslist, of all places. I wish I’d read Garner’s study first! He mailed out surveys to 150 participants. Some received a survey with a Post-it (Post-It group), requesting that the survey be completed, some received a survey with the same message on the survey itself (written-only group), and some just got the survey with no message (no-message group). The persuasive power of the Post-it is quite apparent! 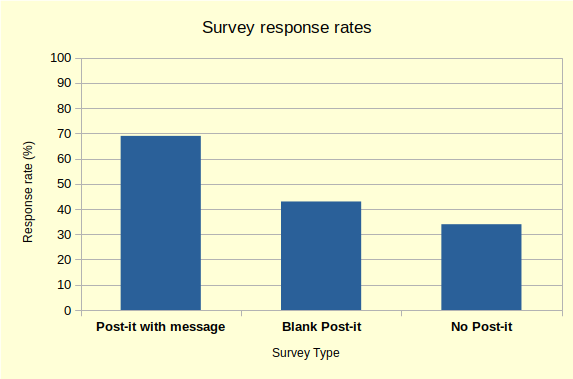 People were more likely to return the survey if there was a Post-it message stuck onto it. 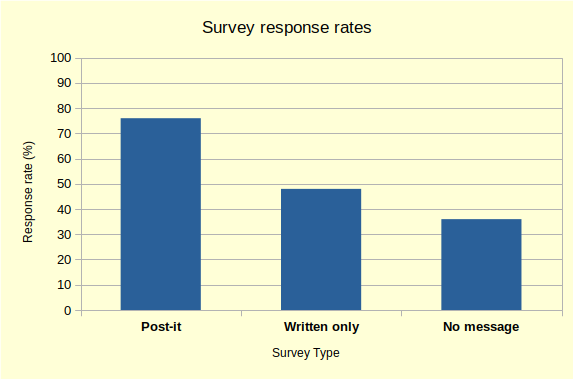 The same message written on the survey itself did not have the same effect, so it’s not simply the written request that is causing the higher response rates; the Post-it is essential. But what would happen if you didn’t put a message on the Post-it? Maybe the Post-it is just novel or attention grabbing, and that’s enough by itself? Garner tested this too, making a couple of changes to his study. Again, he used three groups, but this time one received a Post-it with a message, one with a blank Post-it, and the final group got a survey with no Post-it. Similar results. Clearly, you need both the message and the medium for this to work; although a blank Post-it did increase the response rate slightly. In a third study, Garner found that the humble Post-it meant people responded to the surveys sooner, and also left more comments in the open-ended questions sections! How far can you take this? It makes you wonder. If a simple Post-it note with a message can increase survey response rates, what else can it do? If I write a love letter to a hundred women, and put a Post-it note on requesting that they send one back, would I get more replies? If I write a letter of complaint to a company, with a Post-it note asking for a quick response, will I get one? And also, how can the Post-it message be improved? The red bar is the simple survey, and as you can see, the results increased slightly because of the personalised message. But look at the purple bar, showing the complex, long-winded survey. The standard Post-it message used previously performed quite poorly. 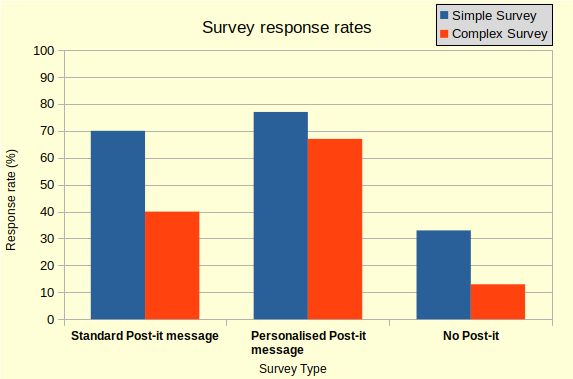 But when the message was personalised, the response rate was only 10% less than the easy survey! So if you’re trying to get people to do a complex task, you need to personalise the request. Find out the name of the person you’re sending your survey (or whatever) to, and put it on the Post-it note, along with a thank you and your initials. The idea behind this is that a Post-it with a message is viewed as a personal request, a favour. It activates the principle of social reciprocity, more commonly known as ‘you scratch my back I’ll scratch yours’. Someone’s gone to the trouble to write you out a message on a Post-it and stick it to the survey – it’s not just a machine, printing out letters from a mail merge and some person stuffing them in an envelope – there’s a human being reaching out and making contact with you. The least you can do is respond! Polite, reciprocal compliance is one of our cultural norms, and the Post-it activates this. Taking a wider view, we can see that the norm to return a favour is activated even when a the initial favour wasn’t even requested in the first place. You might have seen this tactic used by salespeople, offering you a free toaster or pen. These findings will be useful to keep in mind, not only to tell when you’re being influenced, but also to help you out if you have a survey or project of your own that you need a good response rate to. Spending a little time writing out a personalised Post-it request will be well worth the time and effort. Garner, R. (2005). Post-It Note Persuasion: A Sticky Influence. Journal of Consumer Psychology. 15(3), 230-237. Note: I made the graphs using http://onlinecharttool.com – completely free and recommended if you’re bored with the Excel graphs! Thanks for the interesting link. I’ve wondered the same thing about online surveys, like perhaps using a pop up with a personalised message or something. But pop ups really just annoy people, so it could go either way. Worth testing, perhaps.